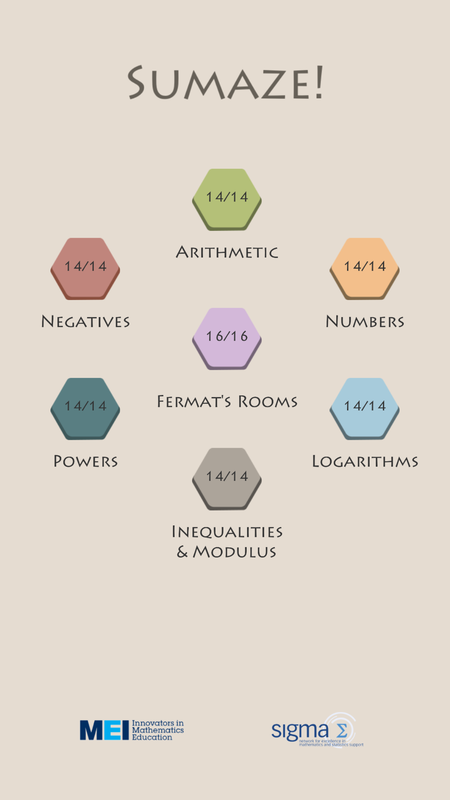 As regular readers will know, I do like puzzle games that involve a bit of maths. The other day I came across a fantastic free iOS app (also available on Android) jointly created by MEI and the Sigma Network called Sumaze! which really hit the spot. Sumaze! 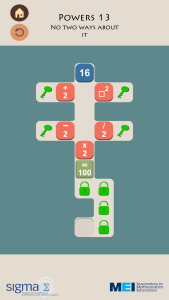 is a puzzle game in which you are required to move a tile through a number maze to get to the goal. There are various ‘gates’ in the way that can only be passed through if your tile displays the correct number. There are 7 sections (see below) containing 14 levels which obviously increase in difficulty as you go. I managed to complete it fairly quickly, although I struggled a little on the later levels! The level shown below, particularly had me stumped for a while, although there was a simple solution in the end. Below is a quick video guide and review. I imagine Sumaze! could be used with A-Level students after they have been introduced to logarithms and modulus functions. I would be interested, however, in using it with GCSE students as the way the game is designed, students would pick up on things like the modulus function and logarithms through experimentation. 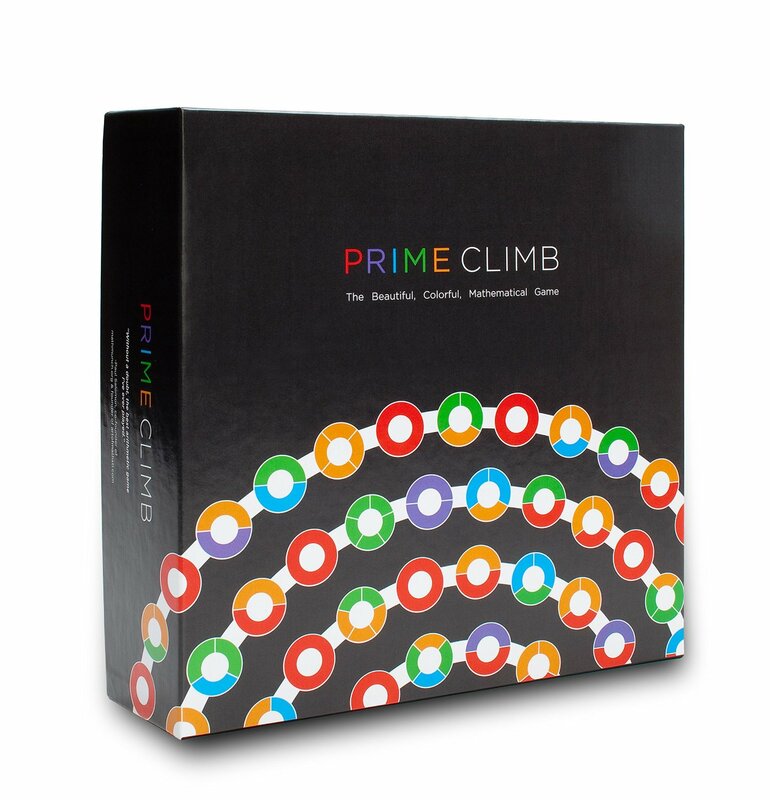 The best part of the game is that it really challenges your problem solving skills, particularly in the later levels. I really hope they work on introducing some more levels as the concept is fantastic! If you like puzzle games, be sure to check out this post. This entry was posted in A Level, Android, apps, Games, iOS. Bookmark the permalink. I am stuck on Numbers Level 13 “Split the difference”. You have obviously managed to do it although to me it seems like it is not possible. What am I missing? What’s the simple solution for Powers 13? Been stuck on it for a week! I was stuck on this for a while too! If you email me I’ll give you a clue rather than post anymore spoilers here! Inequalities and Modulus, q12…. How the heck is this possible! Aim to get to 20 without using the “-5” tile. What is the solution to fermats rooms level 6? I have been on it for weeks! help on the 2nd last level of fermat’s room!! If you have got this far, I’m sure you will work it out! What can you multiply “-1” by to get 3? stuck on fermats room 7!! Been nearly a month and still not able to do the right hand side….any help will be much appreciated! Get through the red locks with 128..
Any hints for Powers 14? Been stuck on powers 13 for a week now. I have tried everything ☹️ Please can i have some help? Thank you i have already solved it! Great! Good luck with the rest of it!! You don’t have to go directly to the 10 after you have collected the logarithm.. 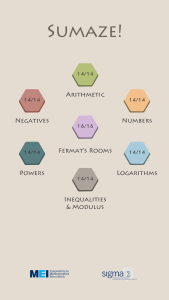 Negatives 7 is the hardest one yet, the trick is to aim for the common denominator of all the gates.